Like peanut butter and jelly, Saturdays and soukous music is the perfect pairing that never gets old. When the sun is out, blue sky above, everyone at the parks a record like this from Bumba Massa is the vibe you can’t go wrong with. My theory is that Colombiano who created Zumba back in the 90s was actually listening to some Congolese Soukous when he came up with the workout sensation that swept the world. Just listen to this record by the late great Pépé Kallé and guarantee you’ll be up moving and ready to get dance workout on. Posting this Abeti Masikini record later than I had hoped (8:30 pm CA time), but better late than never. In this track “Gogo” Abeti manages to create a song that is both soothing and emotional over an excellent drum break—a perfect song for a chilly winter night. Today being #45Friday (on Fridays folks on Twitter and Instagram share pics of their favorite 7″ 45rpm records) it gives me the perfect opportunity to share one of my favorite 7″ singles from the past year—Trio Madjesi et Orcestre Sosoliso’s Tshitsha. 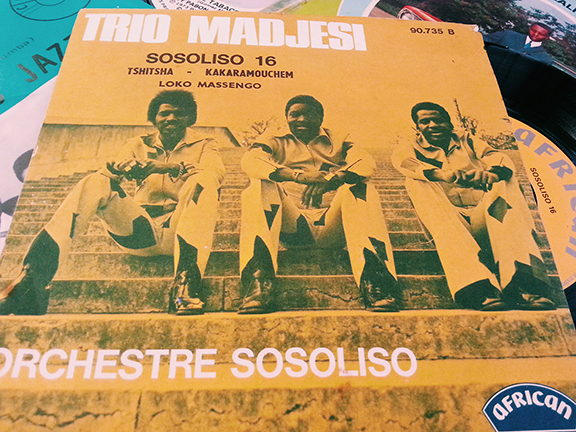 Trio Madjesi were one of the slew of “youth groups” that Zaire was churring out in the late 60s-early 70s. The trio of singers emerged out of Verkey’s group Orchestere Vévé and who’s name Madjesi was formed from combining their own nick names: Matadidi, Djeskain, and Sinatra. As you’ll notice it didn’t end with combining of names. This may be one of the few song you’ll hear combining Spanish, Lingala and English in one amazing soukous track – just wait until the 3:30 mark. In 1969 James Brown made the historic trip to Zaire where he performed several shows in Kinshasa that was originally apart of the promotion of the Muhammad Ali vs George Forman “Rumble in the Jungle” fight. Those shows had a huge impact on the many young performers like Trio Madjesi. Check out this awesome 25 minute clip from 1973 TV appearance where you can easily see how they incorporated a lot of James Brown’s show style performance. My favorite part comes half way through when they perform in the full Zaire national team football kit while juggling a ball—or rather try to (you recall Zaire qualified the only time in their history for the 1974 World Cup where they didn’t fair so well.) Enjoy!